<h2>Activating a liquid with plasma gives it anti-cancer properties</h2><br /><p>Plasma is an ionised gas – a gas that carries an electric charge after losing some of its electrons by heat or via an electromagnetic field. In thermal plasmas, such as that found on the surface of the sun or in a welding torch, the majority of the particles are ionised, and temperatures can reach dangerous levels.</p> <p>In cold plasma, by contrast, only a few of the particles are ionised, with the result that it maintains a temperature of about 25 to 37°C – between room temperature and body temperature. This makes it a candidate for use in medical applications.</p> <p>In 2007, scientists found that <a href="https://link.springer.com/article/10.1007/s11090-007-9048-4" target="_blank" rel="noopener noreferrer">plasma could be used to kill melanoma cells</a> and since then a number of studies have explored its application in other types of cancer such as brain, breast, lung and cervical. As well as being able to selectively kill cancer cells, cold plasma seems to increase the cells’ responsiveness to chemotherapy and immunotherapy.</p> <p>How and why it can do this remains not fully understood. It could, however, have something to do with the properties of the plasma’s ions, electrons and other molecules – collectively known as species – which interact with the cancer cell membrane or other molecules in the cancer cells.</p> <p>‘Plasma creates a cocktail of reactive species, such as electrons, ions and radicals, besides neutral gas molecules, which makes it useful for various applications,’ said Professor Annemie Bogaerts, a plasma specialist at the University of Antwerp in Belgium.</p> <p>‘The reactive oxygen and nitrogen species produced (by using cold plasma) are thought to be responsible for the biological effects to cells and are important for cancer treatment,’ she said.</p> <p><strong>Intolerable stress</strong></p> <p>Cancer cells have higher levels of reactive oxygen species as opposed to normal cells, so when they are attacked by the plasma’s additional reactive oxygen species they suffer intolerable stress which causes cell death, says Prof. Bogaerts.</p> <p>She and Dr Pankaj Attri, also at the University of Antwerp, are trying to better understand cold plasma and its interactions with cancer cells to develop a safe treatment method, as part of a project called Anticancer-PAM.</p> <p>Besides the direct application of plasma on cancer cells, cold plasma can also be used to activate a liquid medium, such as water, which is then known as a plasma-activated medium (PAM).</p> <p> <div class="quote-view quotesBlock quote_horizontal"> <div class="quotesTop"><img src="https://horizon-magazine.eu/sites/all/themes/horizon/images/quotes_top.png" alt="" title="" /></div> <p>'The research on plasma for cancer treatment started about ten years ago, so it’s still in its early stages and more fundamental research is needed. '</p> <blockquote><p>Professor Annemie Bogaerts, University of Antwerp, Belgium</p></blockquote> <div class="quotesBottom"><img src="https://horizon-magazine.eu/sites/all/themes/horizon/images/quotes_bottom.png" alt="" title="" /></div> </div> </p> <p>Anticancer-PAM is aiming to measure the direct effects of such a medium on cancer cells by using what’s known as a catalase model protein. This stands in for the enzyme catalase, produced by cells to protect them from significant damage known as oxidative stress. By using a catalase model protein, the team will be able to reveal how the plasma-activated medium works and how exactly catalase is affected by cold plasma.</p> <p>Specifically, the team will be carrying out experiments and developing a computer model to understand the medium’s properties and the plasma-liquid interactions, as well as which species created in the liquid are important for cancer treatment.</p> <p>‘Plasma-activated media, also called plasma-treated solutions, seem to have a similar anti-cancer potential as direct plasma treatment, and can be applied more generally like in tumours inside the body,’ she said.</p> <p>A plasma-activated liquid is more suitable for use in the body than direct plasma treatment as it can be made outside the clinic, stored like a medicine and applied by directly injecting it into the patients’ tissue, explains Prof. Bogaerts. By contrast, a direct plasma treatment needs a standardised plasma source and is harder to use inside the body, and would be limited to applications during surgery or to treat skin cancers and wounds.</p> <p><strong>Mice</strong></p> <p>Prof. Bogaerts says the results look promising so far. After giving mice plasma-treated water, the team has observed that chemotherapy-resistant lung cancer tumours shrank in size as much as existing treatments, but without any side effects. ‘This could be important for practical applications of plasma-treated solutions for cancer treatment,’ said Prof. Bogaerts.</p> <p>The reactive species found in plasma also gives it anti-bacterial and anti-viral capabilities, which means that it is also being explored as a treatment in other areas.</p> <p>As part of a project called LTPAM, Prof. Bogaerts is working with Dr Yury Gorbanev to explore the chemistry behind how the plasma jet activates the liquid in a plasma-activated medium. 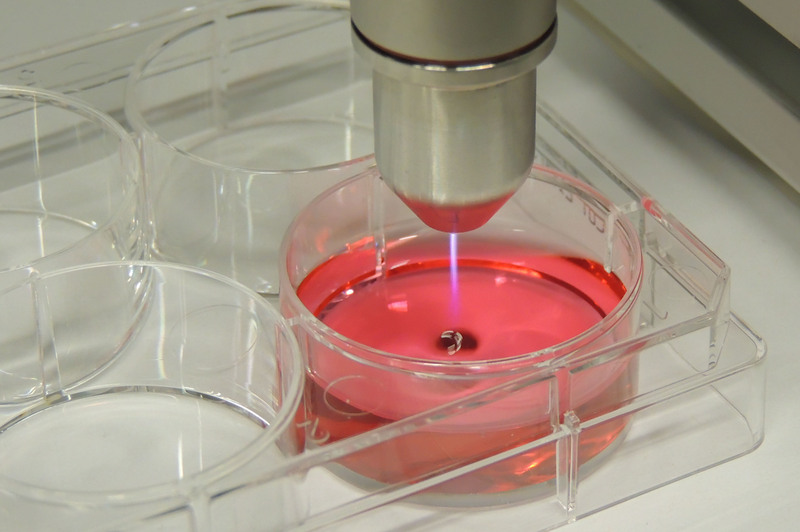 The aim is not only to better understand cold plasma’s anti-cancer properties, but also to investigate its potential in other medical applications, such as wound healing, dental treatment and disinfection.</p> <p>In particular, the team is looking into a specific plasma source called RF COST plasma jet, and is trying to find the important reactive species produced and whether these are created by the jet or within the liquid.</p> <p>While plasma may seem to promise a host of direct biomedical applications, Prof. Bogaerts notes that more research is still needed to understand plasma in biomedicine to guarantee a safe application.</p> <p>‘The research on plasma for cancer treatment started about ten years ago, so it’s still in its early stages and more fundamental research is needed,’ she said.</p> <p>Dr Carsten Mahrenholz, who has developed a cold plasma dressing for treating chronic wounds at COLDPLASMATECH in Germany, agrees. ‘Although studies have shown that cancer cells die quicker than normal cells with cold plasma, this is still in very early stages so we have to be humble about whether cold plasma can actually treat cancer,’ he said.</p> <p>He also says that he sees cancer treatment potentially working on the surface or in conjunction with other procedures, such as surgery or chemotherapy. He added: ‘Nevertheless, scientifically, this is an interesting field and I hope we can someday help cancer patients beyond the benefit of palliation with this promising new technology.’</p> <p><em>The research in this article was funded by the EU. If you liked this article, please consider sharing it on social media.</em></p> <p><a href="http://bit.ly/newsalertsignup" target="_blank" rel="noopener noreferrer"><img src="https://horizon-magazine.eu/sites/default/files/news-alert-final.jpg" alt="" width="983" height="222" /></a></p> <br /> <img src=”http://www.google-analytics.com/collect?v=1&tid=UA-40077089-1&cid=activating-a-liquid-with-plasma-gives-it-anti-cancer-properties&t=event&ec=republish&ea=read&el=activating-a-liquid-with-plasma-gives-it-anti-cancer-properties&cs=republish&cm=republish&cn=republish&cm1=1" /> This post <a href="https://horizon-magazine.eu/article/activating-liquid-plasma-gives-it-anti-cancer-properties.html">Activating a liquid with plasma gives it anti-cancer properties</a> was originally published on <a href="https://horizon-magazine.eu/">Horizon: the EU Research &amp; Innovation magazine | European Commission</a>. Plasma is an ionised gas – a gas that carries an electric charge after losing some of its electrons by heat or via an electromagnetic field. In thermal plasmas, such as that found on the surface of the sun or in a welding torch, the majority of the particles are ionised, and temperatures can reach dangerous levels. In cold plasma, by contrast, only a few of the particles are ionised, with the result that it maintains a temperature of about 25 to 37°C – between room temperature and body temperature. This makes it a candidate for use in medical applications. In 2007, scientists found that plasma could be used to kill melanoma cells and since then a number of studies have explored its application in other types of cancer such as brain, breast, lung and cervical. As well as being able to selectively kill cancer cells, cold plasma seems to increase the cells’ responsiveness to chemotherapy and immunotherapy. How and why it can do this remains not fully understood. It could, however, have something to do with the properties of the plasma’s ions, electrons and other molecules – collectively known as species – which interact with the cancer cell membrane or other molecules in the cancer cells. ‘Plasma creates a cocktail of reactive species, such as electrons, ions and radicals, besides neutral gas molecules, which makes it useful for various applications,’ said Professor Annemie Bogaerts, a plasma specialist at the University of Antwerp in Belgium. ‘The reactive oxygen and nitrogen species produced (by using cold plasma) are thought to be responsible for the biological effects to cells and are important for cancer treatment,’ she said. Cancer cells have higher levels of reactive oxygen species as opposed to normal cells, so when they are attacked by the plasma’s additional reactive oxygen species they suffer intolerable stress which causes cell death, says Prof. Bogaerts. She and Dr Pankaj Attri, also at the University of Antwerp, are trying to better understand cold plasma and its interactions with cancer cells to develop a safe treatment method, as part of a project called Anticancer-PAM. Besides the direct application of plasma on cancer cells, cold plasma can also be used to activate a liquid medium, such as water, which is then known as a plasma-activated medium (PAM). Anticancer-PAM is aiming to measure the direct effects of such a medium on cancer cells by using what’s known as a catalase model protein. This stands in for the enzyme catalase, produced by cells to protect them from significant damage known as oxidative stress. By using a catalase model protein, the team will be able to reveal how the plasma-activated medium works and how exactly catalase is affected by cold plasma. Specifically, the team will be carrying out experiments and developing a computer model to understand the medium’s properties and the plasma-liquid interactions, as well as which species created in the liquid are important for cancer treatment. ‘Plasma-activated media, also called plasma-treated solutions, seem to have a similar anti-cancer potential as direct plasma treatment, and can be applied more generally like in tumours inside the body,’ she said. A plasma-activated liquid is more suitable for use in the body than direct plasma treatment as it can be made outside the clinic, stored like a medicine and applied by directly injecting it into the patients’ tissue, explains Prof. Bogaerts. By contrast, a direct plasma treatment needs a standardised plasma source and is harder to use inside the body, and would be limited to applications during surgery or to treat skin cancers and wounds. Prof. Bogaerts says the results look promising so far. After giving mice plasma-treated water, the team has observed that chemotherapy-resistant lung cancer tumours shrank in size as much as existing treatments, but without any side effects. ‘This could be important for practical applications of plasma-treated solutions for cancer treatment,’ said Prof. Bogaerts. The reactive species found in plasma also gives it anti-bacterial and anti-viral capabilities, which means that it is also being explored as a treatment in other areas. As part of a project called LTPAM, Prof. Bogaerts is working with Dr Yury Gorbanev to explore the chemistry behind how the plasma jet activates the liquid in a plasma-activated medium. The aim is not only to better understand cold plasma’s anti-cancer properties, but also to investigate its potential in other medical applications, such as wound healing, dental treatment and disinfection. In particular, the team is looking into a specific plasma source called RF COST plasma jet, and is trying to find the important reactive species produced and whether these are created by the jet or within the liquid. While plasma may seem to promise a host of direct biomedical applications, Prof. Bogaerts notes that more research is still needed to understand plasma in biomedicine to guarantee a safe application. ‘The research on plasma for cancer treatment started about ten years ago, so it’s still in its early stages and more fundamental research is needed,’ she said. Dr Carsten Mahrenholz, who has developed a cold plasma dressing for treating chronic wounds at COLDPLASMATECH in Germany, agrees. ‘Although studies have shown that cancer cells die quicker than normal cells with cold plasma, this is still in very early stages so we have to be humble about whether cold plasma can actually treat cancer,’ he said.